The troubled R&B singer sobbed during a concert in Mississippi. Houston's and Brown's dysfunctional marriage and mutual drug abuse are widely believed to have been the central catalysts in Houston's mid-2000 mental breakdown. 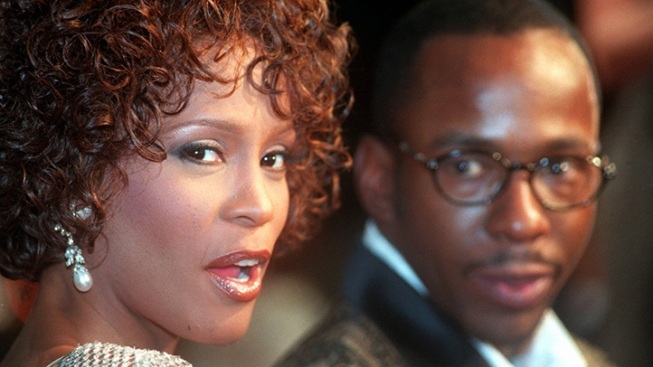 Bobby Brown was visibly shaken by the news of his ex-wife Whitney's Houston's sudden death on Saturday night. The 43-year-old R&B singer—whose long-running battles with drug addiction and frequent law-breaking have tended to overshadow his musical career—broke down crying before the start of a previously scheduled concert in Mississippi, according to US Weekly. While his group New Edition—a once-popular 1980s boy-band act—performed an opening number, Brown remained backstage and wept. According to a concert attendee cited by US Weekly, Brown then appeared onstage to great applause and cheering and performed "Hit Me Off," a track from New Edition's 1996 album "Home Again." Later, Brown shouted "I love you, Whitney!" and blew a kiss to the sky. US Weekly reports that Brown appeared noticeably teary-eyed and anguished. The waterworks returned during Brown's rendition of the ballad "Roni," originally released in 1988. Brown reportedly sobbed during this segment of the concert and called on the audience to join him in song. Sunday, he released a statement to People Magazine. "I am deeply saddened at the passing of my ex-wife, Whitney Houston ... At this time we ask for privacy, especially for my daughter, Bobbi Kristina. I appreciate all of the condolences that have been directed towards my family and I at this most difficult time." The Houston Family issued a separate statement to CNN: "We are devastated by the loss of our beloved Whitney. This is an unimaginable tradgedy and we will miss her terribly. We appreciate the outpouring of love and support from her fans and friends." Brown and Houston were married from 1992 to 2007 and shared a daughter named Bobbi Kristina, now 18. In 2007, in the wake of the couple's high-profile divorce proceedings, a judge awarded Houston full custody of their child.